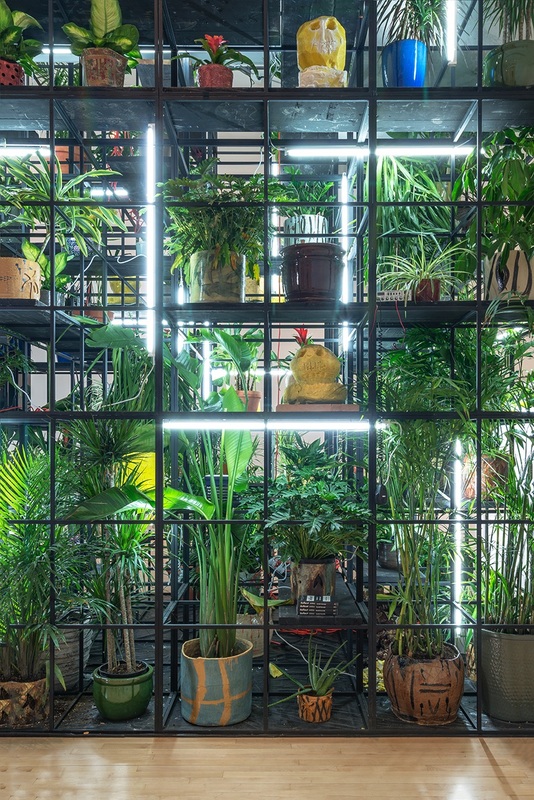 Hail We Now Sing Joy features a new body of work by Chicago-born, New York-based artist Rashid Johnson, a chapter following his acclaimed exhibition Fly Away at Hauser & Wirth Gallery, New York. 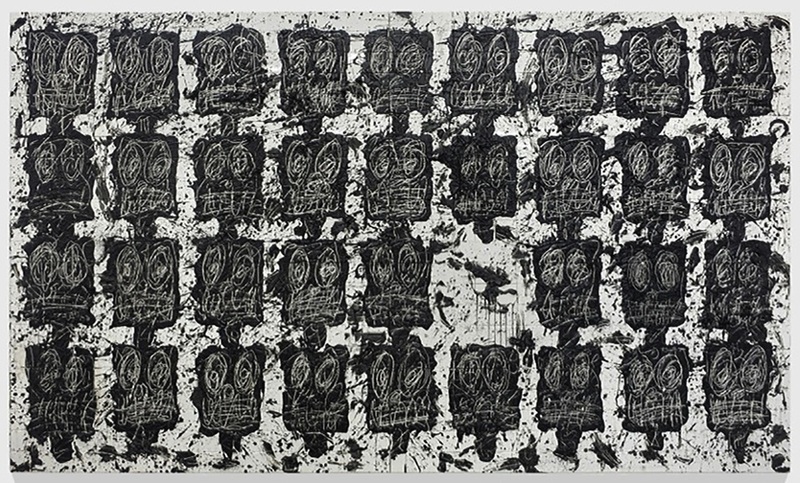 This exhibition includes Johnson’s Anxious Audience, large-scale panels of white ceramic tile covered with dozens of agitated faces scrawled in black soap and wax. The new Falling Men works, in which Johnson uses his signature materials of white ceramic tile, red oak flooring, mirror fragments, and black soap and wax splatters, depict inverted figures falling through the air that can be read as flying heroes or chalk outlines of deceased bodies from crime scenes. 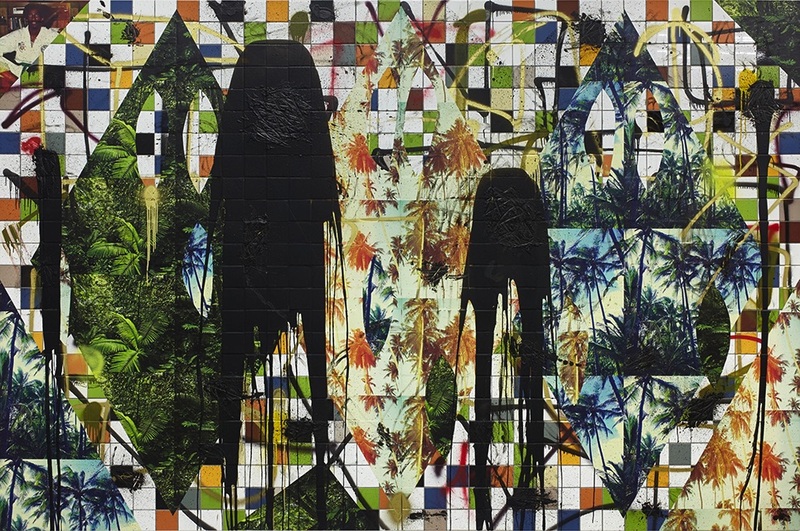 The Escape Collages consist of large-scale vinyl images of lush tropical environments atop a modernist tile surface, some of Johnson’s most complexly layered works that introduce an expanded palette into his practice. Themes of anxiety, escape, and identity reach a climax in Antoine’s Organ, Johnson’s newest sculptural installation and the largest of his architectural grid works ever shown in the United States. 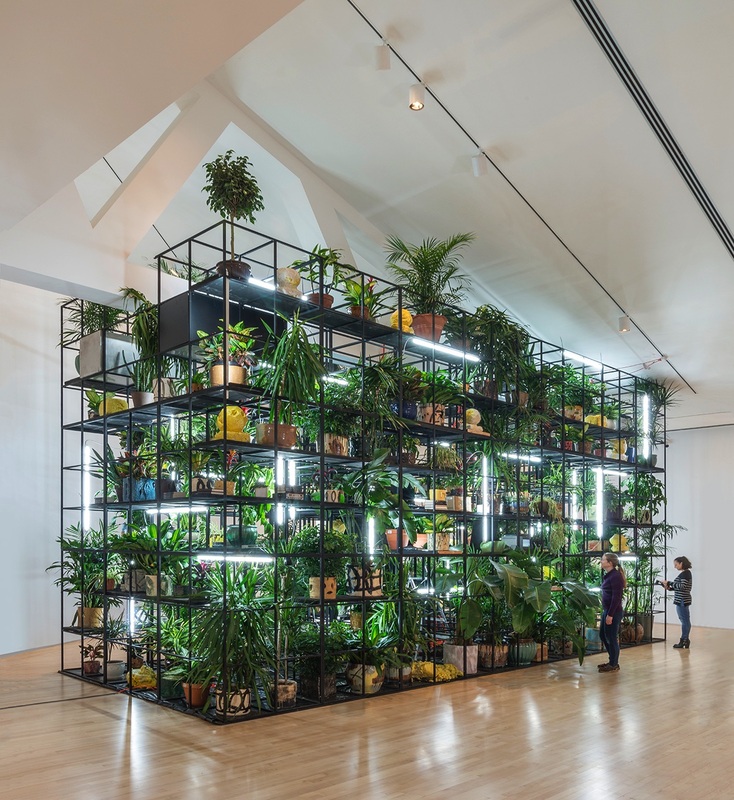 Johnson’s towering minimalist grid structure is bursting with hundreds of potted plants, videos, lights and sculptures, creating a lush oasis that engages his audience with music, literature, and video, transitioning the anxiety expressed in other works in the exhibition into action. While on display at Kemper Museum, professional and student pianists provided pop-up performances on a piano hidden within the installation. A key partner for this exhibition was the American Jazz Museum, which co-hosted a talk by Johnson at the Gem Theatre; curated a series of jazz performances in the Museum’s Atrium; and helped fill a robust schedule of local and national volunteer musicians who participated in the sound component of the exhibition throughout the show. Hail We Now Sing Joy is a music track by musician and composer Joseph Jarman for The Meeting, a jazz reunion album released in 2003 by Art Ensemble of Chicago. In his review of the album, Kurt Gottschalk talks of Hail We Now Sing Joy and other songs not as a reunion (since the bands members have come and gone and come back again over the years) but a “meeting” in the true spirit of jazz. This sentiment is strongly felt in the development of American jazz in Kansas City, a rich location and experimental jazz epicenter between New Orleans and Chicago. 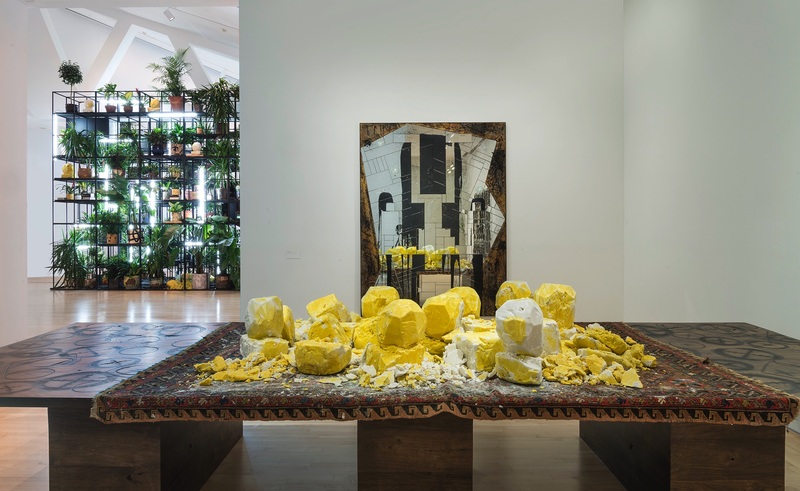 Use of this title suggests that Johnson’s exhibition is a meeting of the themes of identity, Afro-futurism, and the African American experience synonymous with his body of work, while incorporating new motifs that speak to the current climate of anxiety and tension that seeks resolution. 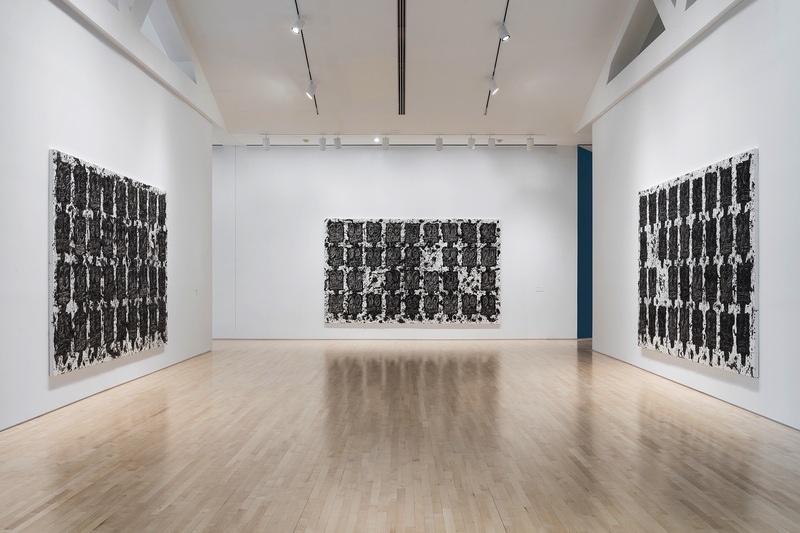 Rashid Johnson: Hail We Now Sing Joy is organized by Kemper Museum of Contemporary Art, Kansas City, Missouri, and curated by Erin Dziedzic, director of curatorial affairs at Kemper Museum. 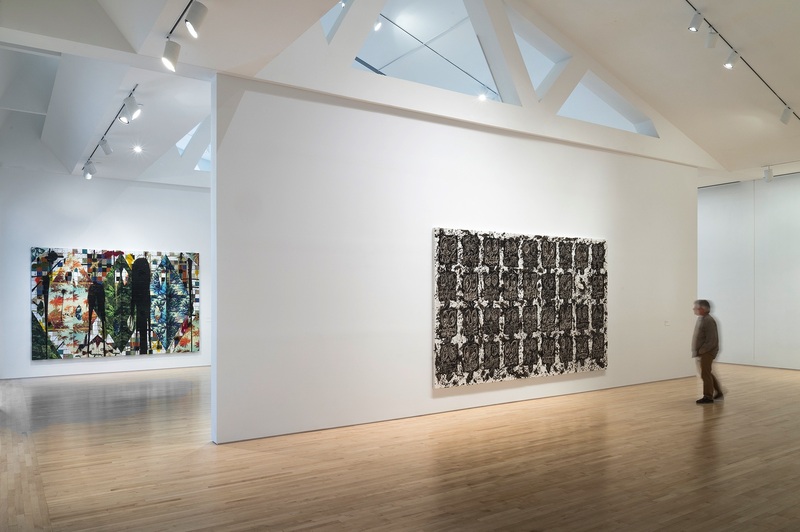 The exhibition has been generously supported by the R. Crosby Kemper Jr. Exhibition Fund, UMB Bank, n.a. Trustee, and Sustaining Sponsor Schmitt Music Piano Center. Financial assistance was provided by generous donors and members, especially: Missouri Arts Council, a state agency; The Sullivan Family Foundation, Jo Ann and William Sullivan; The Family of Mary Beth Smith Docent Program; Arvin Gottlieb Charitable Foundation, UMB Bank, n.a., Trustee; Harry Portman Charitable Trust, UMB Bank, n.a., Trustee; Jane Voorhees; Christy and Bill Gautreaux; Jack and Karen Holland Visiting Artist Fund; Louis & Elizabeth Nave Flarsheim Charitable Foundation, Bank of America, N.A., Trustee; Francis Family Foundation; Miller Nichols Charitable Foundation; Nichols Company Charitable Trust; Oppenstein Brothers Foundation, Commerce Bank, Trustee; The Sosland Foundation; Courtney S. Turner Charitable Trust, John H. Mize, Jr. and Bank of America, N.A., Trustee; The H&R Block Foundation. The opening dinner is sponsored in part by Sharon and John Hoffman.